Keeping your PC running in top condition is about more than clearing up space or looking for memory hogging programs that have run astray. Processors can overheat and are tricky in smaller builds, but if you have the best low profile CPU cooler in your system, you’ll never have to sweat a meltdown. When your case is cramped, you’re going to need something a bit more svelte than your typical CPU cooler. That’s where low profile designs come into play, and we’ve found several that are standouts if you’re looking to take the temperature down a few notches in your PC. Before we get to the best of the bunch, we’re going to go over a few areas in case this is your first aftermarket CPU fan. We aren’t going to cover installation, but our guide will help you find the perfect cooling solution for your processor. Unlike the wild world of GPU coolers, there are two styles of CPU coolers for the most part with Liquid CPU coolers and Air-based systems. Both will get the job done, but liquid tends to be the more popular option when it comes to the best low profile CPU cooler for overclocking. A good air cooler can be just as effective however and is considerably cheaper. We’re just going to cover fan and radiator-based air coolers this time around, but this will explain the differences between the two quite nicely. It doesn’t matter if you’ve got your eye set on an RGB CPU cooler or just want something simple – compatibility is critical. This is one area where things are clear-cut considering the specs you need to know are readily available. If you’re in a rush, be sure to check out the TDP rating along with the height and overall dimensions of the cooler. Warranties are always important when it comes to PC components although it’s an overlooked area with CPU coolers. They can vary from a couple of years to close to a decade although price often dictates the warranty length. Noctua is one of the leaders when it comes to PC cooling tech, so it’s no surprise they found themselves on our list. The NH-L9i is a low-profile cooler that fits a variety of builds and ideal if you want a powerful solution for your PC. The Noctua NH-L9i is an air-based cooler built to work with smaller systems where space is tight. It’s only 37mm high with the fan attached, weighs 420 grams and measures 95mm wide by 95mm deep. It won’t take up much space in your case, and it’s one of the quieter models around if you use the Low-Noise Adapter which can drop things down to 14.8 dBA. This CPU fan comes with the SecuFirm2 mounting kit and is outfitted with the company’s NT-H1 thermal compound. It’s compatible with Intel sockets LGA1150, LGA1151, LGA1155 and LGA1156 and sports a 6-year warranty as well although you’ll want to refer to their compatibility list. This one’s only for Intel machines, but if you rock an AMD chip, the NH-L9a has you covered. Whenever a company uses the word “Quiet” in their moniker, they need to be able to produce a product that lives up the type. We’re pleased to say the minds at be quiet! have delivered with the Shadow Rock LP, the quietest cooler to make the cut. While this CPU cooler has a similar design to the rest of the pack, its performance sets it apart. Well, that and the noise level. At full speed, it’s rated at 25.5 dBA which is impressive, and the 120mm Pure Wings 2 PWM fan will definitely keep things cool. It gets some help from a sturdy heatsink as well which has 54 aluminum fins on the top and 32 on the bottom. The be quiet! Shadow Rock LP measures 134mm x 122mm x 75.4mm unmounted with a weight of 390 grams. This cooler is a little taller than others but twice as quiet and that 1,500 RPM fan has a lifespan of 80,000 hours to boot. The be quiet! BK002 comes with a 3-year warranty and is a compatible with AMD sockets AM2(+), AM3(+), AM4(+), FM1, and FM2(+). As for Intel, we have the 775 / 115X / 1366 and LGA2011. If you felt Noctua’s cooler was a little bland, the Engine 27 1U may be more your speed. It has a unique design that will grab your attention and has one of the lowest profiles we’ve found if you have an Intel-based machine. This aluminum beauty is designed for optimum performance in HTPC, POS terminals and mini PCs. 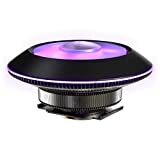 The all-metal design includes a copper base with nickel plating which provides excellent heat dissipation when combined with the 40 blade PWM fan. That fan is capable of hitting speeds between 1,500 – 2,500 RPM and has a decibel rating of 13 – 25 dBA. The Thermaltake Engine 27 1U is compatible with 70W chips and the usual Intel sockets with the LGA 1150, 1151, 1155, and 1156. It has a lifespan of 50,000 hours and is lightweight at only 310 grams. While it is expensive, it will look great in your case and performs as advertised. Sometimes a simple fan just won’t cut it, and you need something a little beefier to cool your CPU. If you’re not ready for liquid, consider the Gabriel from DeepCool, a small system that comes with a heatsink and pipes. At first glance, it’s obvious this cooler is a bit different. 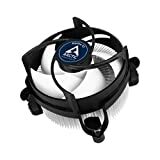 It has a 120mm PWM fan with speeds of 900 – 1,800 RPM, but that fan is attached to a nickel plated heatsink which looks good but is also resistant to oxidization. The copper sink has aluminum fins and four 6mm heatpipes to cool things down while the fan clocks in with a decibel level of 19.2 to 32.4 dBA. This all-in-one cooler is a little larger than others at 126.5mm x 123.5mm x 60mm, but we dig those quad heatpipes and the fact you can use it with both AMD and Intel sockets. With Intel, you’re good at 92watts with the LGA 115X lineup while AMD users are at 100w with options including the FX X4, X6, X8, FM1, FM2, AM2+, AM3+, AM4 the Athlon X2, and half dozen others. Interested in a cooler that’s compact but follows the zero interference rule? Well, Cryorig may have the solution for your build with the C7 CPU cooler. It’s designed to steer clear of PCI-E and RAM while keeping your AMD or Intel processor nice and cool. The Cyrorig C7 is one of the shorter coolers on our list with a height of 47mm from top to bottom. At 97mm x 97mm, it won’t take up much room, and the mounting kit is nice although you do have to flip the motherboard over for the backplate which can be easier said than done. The 57 fin heatsink is nickel plated with a copper base and four premium pipes while the PWM fan can hit speeds between 600 – 2,500 RPM. This is another cooler that performs as advertised and can handle a wide range of boards with a TDP of 100w. If you have an Intel system, you’re good to go with the 1150, 1151, 1155, and 1156. AMD users are included as well with the FM1, FM2/+, Am2/+, AM3/+, and AM4. The C7 is covered for 3-years and provides a good value for the price. Fan-based CPU coolers aren’t usually too sassy, especially compared to liquid systems or GPU coolers. The MasterAir G100M from Cooler Master is an exception to that rule, and a colorful option if you’re looking for something with a little more flair. If you’ve got one of the best CPUs for gaming, you may want a slick looking fan to keep it cool. The G100M fits that bill with its RGB LED system which has several patterns like Mirage and Stars. The company took a top-down approach to cooling with a 92mm PWM fan with speeds between 600 – 2,400 RPM. The decibel level is listed at 30 dBA at max speed, and you won’t need an RGB board as this one comes with a handy remote. You’ll want to take the term low-profile loosely with this one considering its 75mm high which is twice the size of some options. That said, it’s still an excellent choice and more compatible than other options. For Intel, it works with the LGA 2066, 2011-23, 2011, 1151, 1150, 1155, 1156, 1466 and 776 sockets. AMD users are locked in with the FM1, FM2/+, AM2/+, AM3/+, and AM4. This cooler comes with a 2-year warranty. While CPU coolers aren’t what most people would consider expensive compared to other components, some are definitely more affordable than others. The ARCTIC Alpine 12 falls into that category with a budget-friendly price tag and simple, but effective cooling. This cooler is easy to install compared to other alternatives thanks to a push pin design which means “tool-free” installation. MX-2 has been pre-applied as well, and the radial heatsink design is said to increase cooling capacity considerably. The fan is 92mm with RPWM controls and a range of 100 – 2,000 RPM. There’s also a 0db fan mode below 5% PWM if you prefer to keep your build super silent. The biggest draw of this cooler is the price tag although we like the 95w TDP rating and the fact it’s easy to install as well. It’s not the smallest cooler at 95mm x 95mm x 77mm but is very light at 270 grams and very affordable. You’re out of luck with an AMD board, but ready to rock if you have an Intel 1150, 1151, 1155, or 1156 socket. Whether you have a Mini ITX, Micro ATX or simply want a cooler for your HTPC system, the best low profile CPU cooler is only a click away. Remember to keep your buying guide in mind if you become stuck between models and think ahead when it comes to the thermal design power.